An appetizer to whet your spring appetite – creamy, refreshing ricotta infused with lemon and mint and topped with sweet roasted radishes. I’m rebelling against Mother Nature. On the first day of spring, Mother Nature decided that Boston needed just a little more snow this year because it’s not like we’ve broken any records for snowfall or anything. My rebellion included getting a mani/pedi with Essie’s “Lilacism” color and making this radish crostini to tell Mother Nature she can stick it and I’m going to celebrate spring anyways. Even if it is below freezing. I got on this kick of roasting radishes last summer after I found a recipe for roasted radish & arugula barley salad from Edible Boston that I packed in a mason jar and pretty much ate every day for lunch during my yoga teacher training. Now you know I love roasting fruits and veggies and was amazed when I roasted strawberries for my roasted balsamic strawberry shortcake. But holy moly. Roasting radishes COMPLETELY transforms this vegetable. It really helps to mask some of that inherent bitterness and releases a hint of subtle sweetness. I wanted to create an appetizer that featured these delicious roasted radishes that would be perfect for spring parties and gatherings. Easter brunch or dinner, anyone? 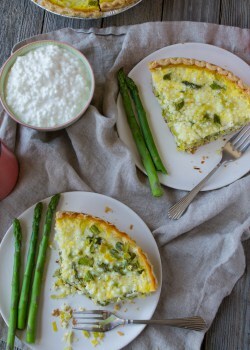 I love this recipe because the ricotta is a great source of protein and calcium and radishes, a type of cruciferous vegetable, is packed with phytonutrients like vitamin C. The creamy ricotta tastes wonderful against the crispy, fresh baguette and pairs perfectly with the refreshing mint and lemon. Transfer radish slices to baking sheet and drizzle with 1/2 tbsp olive oil and salt and pepper to taste. Roast for 15-20 minutes, or until tender. Meanwhile, in a small bowl, mix together ricotta, lemon juice, lemon zest, mint, and salt and pepper to taste. Remove radish slices from baking sheet and set aside. Place baguette slices onto baking sheets and brush remaining olive oil over both sides of baguette slices and bake at 400 degrees for 3-5 minutes, or until golden-brown. 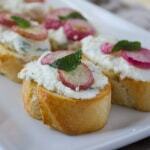 Let bread cool and spread ricotta mixture over each slice and top with two radishes slices. Optional: Garnish crostini with fresh mint. Ugh – can’t wait for winter to be over!! I absolutely love the idea of ricotta and radishes together, especially roasted radishes. I’m going to bookmark this for Easter. Can’t wait! Thanks, Lizzie! Hope you enjoyed it! Thanks! I love radishes too! These are perfect for Spring! I think I’ll add this to my Easter menu! This will be perfect on your Easter table! I love this recipe. 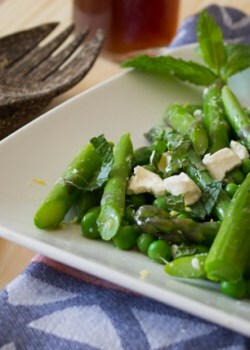 This looks like a super tasty snack or appetizer! Love the refreshing radish topping! 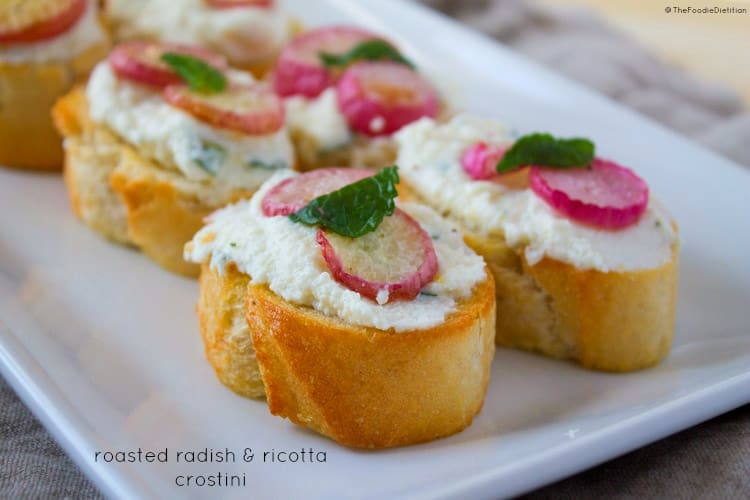 I never know what to do with radishes when I get a bunch in my CSA – love the idea of pairing them with ricotta! Thanks, Deanna! Another simple favorite of mine is radishes + butter + sea salt. Ahhhhmazing. I am obsessed with everything ricotta. I actually need to stop buying it because once I open a container- game over. It’s going on everything. I actually just enjoyed a dinner “app” of pretzels dipped in ricotta. Seriously- the struggle is real. 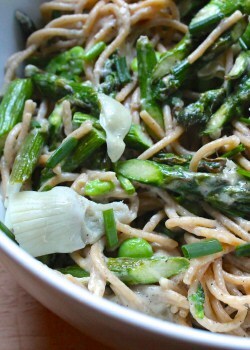 Love this version with roasted radishes! So pretty for spring! Ugh. We just got another 5 inches of snow here in Chicago on Monday so I feel you! Can’t wait for spring to really get here. Also, I haven’t been a big fan of radishes and I would have never thought of roasting them. I can’t wait to try it! These looks so pretty and delicious! 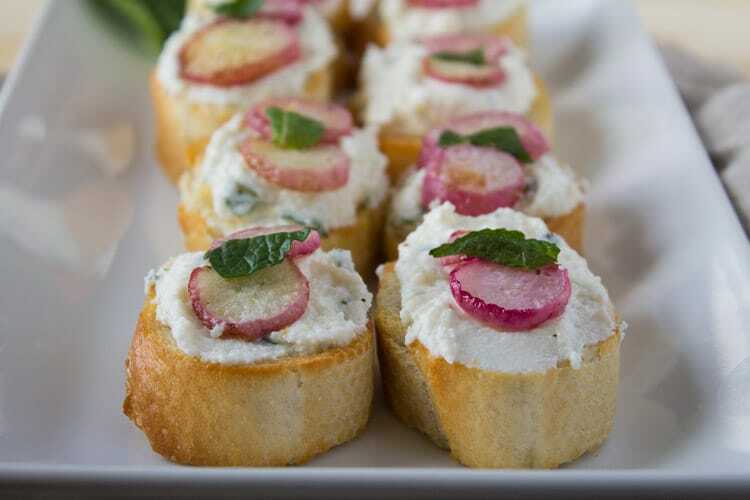 I love ricotta crostini and the addition of the roasted radishes is both delicious and beautiful! Pinning to make as soon as I can get some radishes at the farmers market! Thanks, Jessica! Yes, can’t wait until I see radishes at the farmer’s market!